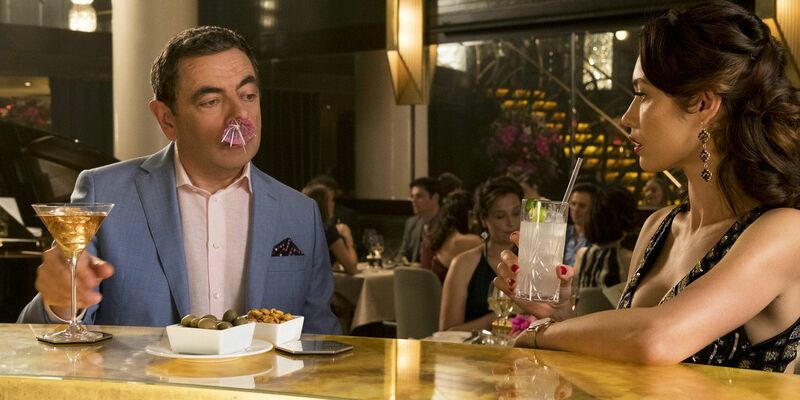 Rowan Atkinson is back for round three in Johnny English Strikes Again, the long-awaited continuation to the story of Her Majesty’s second-favorite secret agent. The third film in the long-running spy spoof sees its title character taking on cyber hackers who have exposed the identities of all of Britain’s agents. Along the way, he trades blows (and sweet dance moves!) with a stunning femme fatale, played by Olga Kurylenko, and investigates a silicon valley billionaire genius, played by The Office‘s Jake Lacy. At a press junket for the film, star Atkinson, best known for his roles in Blackadder and and Mr. Bean, talked about his collaborative process with director David Kerr, as well as the eagerly-anticipated return of Ben Miller as Angus Bough, following his absence from the first sequel, Johnny English Reborn, as well as expressing his happiness at the great success of former co-star Daniel Kaluuya, who has since gone on to star in movies like Get Out and Marvel’s Black Panther. Tell me about working with David Kerr. What does he bring to the series that’s different from what had been done before? He brings a pedigree in comedy, in TV comedy. This is his first proper feature. But it’s always very difficult for people like me to find directors to work with, because, normally, directors are, if you like, the auteur of the piece, and in charge creatively. And even though I absolutely need someone to direct the film, because every film needs a director, I also need a sympathetic and empathetic creative partner, to allow us, together, to create what we want to put on the screen. And that is, as much as anything, it’s a matter of matching personalities, of being able to find someone with whom you can work. It’s a big… For me, I suppose, as the lead performer and co-creator of the script of the film, I need to have a partner in that so we can talk about how it’s shot. Some directors, you would get them in and they’ll say, “Right, I’ll shoot the movie, you just do the acting.” And that’s not how I can work. I need to, because I have a very clear thing in my head about how the film should look, about how jokes are captured, particularly how visual jokes are captured, the timing of that, the framing of the frame. And that’s why I need to have a very cooperative relationship with any director. I spoke to several different directors, all of whom were excellent, but I thought, in the end, that David was the most sympathetic and was going to be the easiest to work with. That’s how it came together. Longtime fans of the series are going to be very happy to see Bough. He’s back. How did that go, since he was mostly absent, except for a deleted scene, in part two. Yes, it’s because the story of the second movie, Johnny English Reborn, required a new, young recruit, which is why we had Daniel Kaluuya play the part, who has since, of course, gone on to much, much greater things than silly comedy movies. And it’s been great to have Ben (Miller) back, because, actually, we had a really good working relationship in the first movie, and all I felt was that we didn’t have enough to do together in the first movie. Johnny English and Bough. I feel as though we do get a little more to do; there’s a scene where we just sit at a cafe and talk about nothing, very much, in this scene in the south of France. And I love the interplay between the two of us, and he’s such a perfect co-performer, such a perfect foil for Johnny English. Johnny English is a pretty weird guy to be stuck with on a mission. He doesn’t really do what he should be doing. He’s always going off on a limb. He’s brave and determined, but also quite foolish at times. And you’re the partner, you’re the guy who has got to accommodate him… And I think that’s what Ben is so good at playing with Bough. It’s the gentle accommodation of Johnny English and his needs and his ambitions and trying to make sure that things don’t go too wrong, even if he knows they’re probably going to go wrong in some form or another.